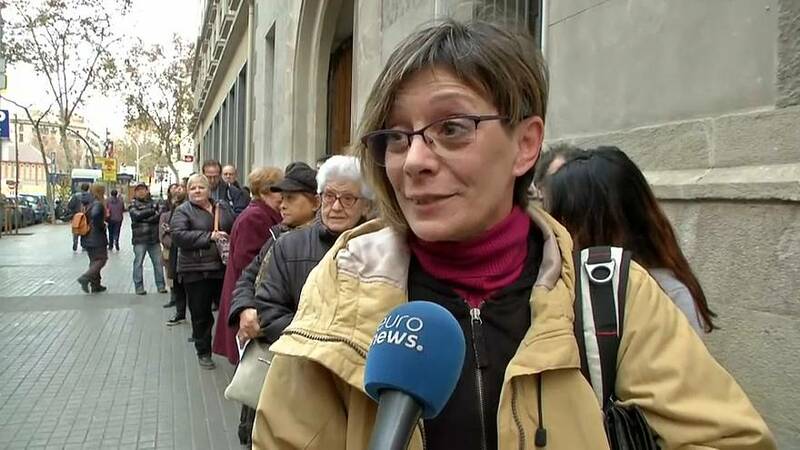 Euronews spoke to some of those who queued up to cast their ballots in Barcelona for seats in the Cataloniana parliament. One man said: "I am from Valencia and I have German origins. I've been living here (in Barcelona) for one and a half years and I think I have the right (to vote). "I don't know if I will stay here in the future, but in any case I think it's important to take part in this election." He added: "I want unity. I think we are stronger together, we are all Europeans, that's my feeling." Another man was asked if he thought the election was important. "Yes, absolutely. If not we go back to the hard franco years, that's for sure." He added: "Independance. There's nothing else, it's either democracy or a regime, "
A woman lining up to vote told Euronews: "Everything is very complicated, tense. "Do you want to know what I really want? I'd like Spain to stay united. I'm neither a fascist nor a separatist. "I belong to a party that fights for animal rights but I'm also a patriot. I love Spain." Another man said: "I feel hopeful. I really hope we can change the trend we've had in the last few years and above all I hope this autonomous region continues to be economically strong, advance. "I want them to let us live in peace, beacuse what we want is to get back to normality, to go back to work and restore social coexistence." Euronews correspondent Cristina Giner reported from Barcelona: "What's at stake in this election is not only the future of Catalonia but also the future of Spain. "This election is unusual, held for the first time on a working day. A high turnout is expected in these divided polls."